I’ve been using both types of compost to pot on the peppers and chillies too, to see how the two compare as an all-rounder. Plus it will be interesting to see if the biochar I’m planning to spread in half the tomato and pepper tunnel works better with the plants that have been potted on in the biochar compost. 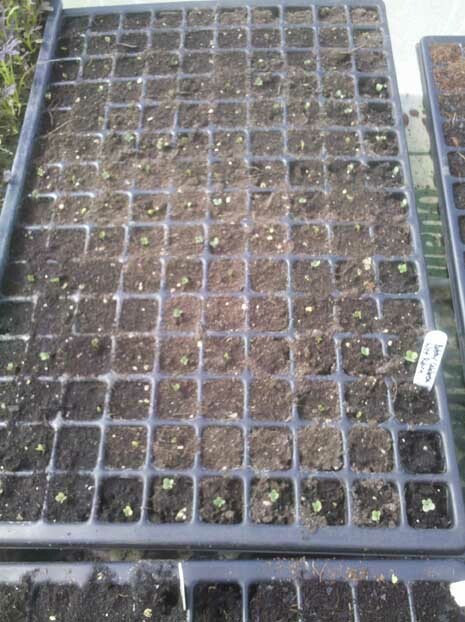 The chillies and peppers have managed to pick up a few aphids along the way; so I’m hoping the tranfer to the bright, warm tunnel from my darkish but heated windowsill propagator will pep them up enough to fight off the attack. 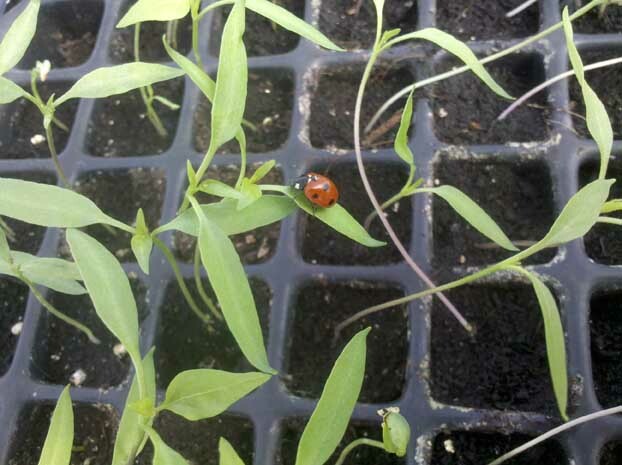 Plus I’ve been tracking down ladybirds emerging bleary eyed from their winter sleep, and placing them carefully right next to the aphids. It’s an amazingly frustrating thing to see a predator scurry straight past (or even over) a pesky pest, without pausing to destroy it. Still, one of the ladybirds seemed to get the idea and paused for a snack, so I’m hopeful. It’s the stripey larvae that really goes to down and munches the aphid, so maybe I should aim for the offspring and set up a ladybird dating service instead. No one can accuse organic growers of being scared of change and innovation. I’ve seen some amazing Heath Robinson-esque contraptions on organic farms, partly because the kind of kit many smaller scale growers need just isn’t available to buy; partly because it’s cheaper to DIY with whatever’s hanging around; but mostly because growers are interested in how things work, and how best to improve on something. Equipment aside, growers are often eager to try out new (or newly rediscovered) varieties; and also growing media. When space is at a premium, such as on my small two acre plot, every inch counts; so it’s a good plan to get some crops off to an early start in compost in a module/propogation tunnel. Organically approved composts are usually peat-free due to the sustainability issues with harvesting peat. There are organically approved peat composts around: I currently use West Riding Moorland Gold, which uses peat washed down river naturally from peat bogs. 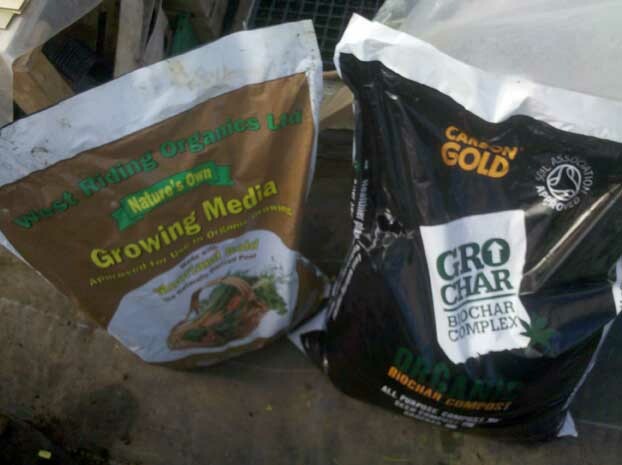 There are also many coir and green waste-based mixes; but now there is a trial going on with some organic growers using Carbon Gold – a coir and biochar mix. I’m taking part too, and the compost looks like what you’d expect: shredded coir and bits of charcoal (there are other less visible additives as well). The plan is to grow the same crops in Carbon Gold and other composts, and see how they compare. 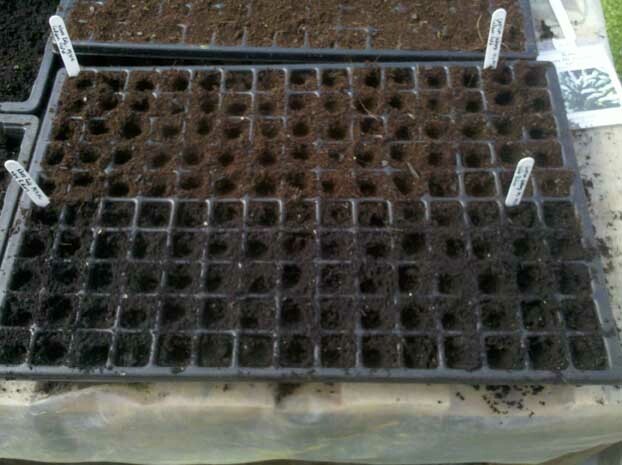 So I’ve sown my first batch of trial plants today: a tray of 150 Belstar F1 calabrese in Carbon Gold, and the same in West Riding. 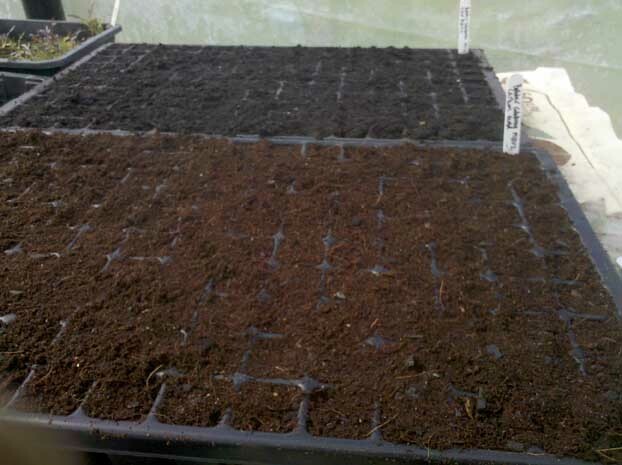 Then 20 seeds of Capricorn F1 cabbage in both; and 55 seeds of nero di toscana kale each in the two mixes. All the trays are in the same place in the propogation tunnel, and I’ll treat them exactly the same (though apparently the Carbon Gold module may need less watering due to better water retention, so I’ll need to keep an eye on that). 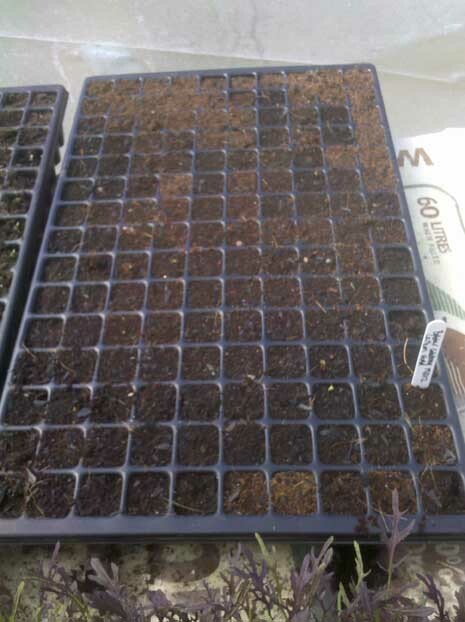 Results to follow: the race to germinate is on!